Things are finally starting to look and feel like spring. The sunny days are peppered with rainy ones, but this week has felt like a huge turning point in the weather. No longer are we trending below average! While I can be a bit a wimp when it comes to taking photos in the rain, it was barely misting, and the center of New Canaan, CT is too pretty to not take photos in, rain or shine. I love everything about this outfit. You look classy and comfy too, my favorite. Loves this confortable outftit. Trench coar is so nice! I'm sure all the flowers in New Caanan help it feel like spring too. Its a classic back ground for a classic outfit. I'm glad the weather has finally turned your way! Such a lovely look! The bag is great! I have been meaning to ask, how many pairs of shoes do you think you own ? Love downtown New Canaan, perfect outfit for shopping the town. 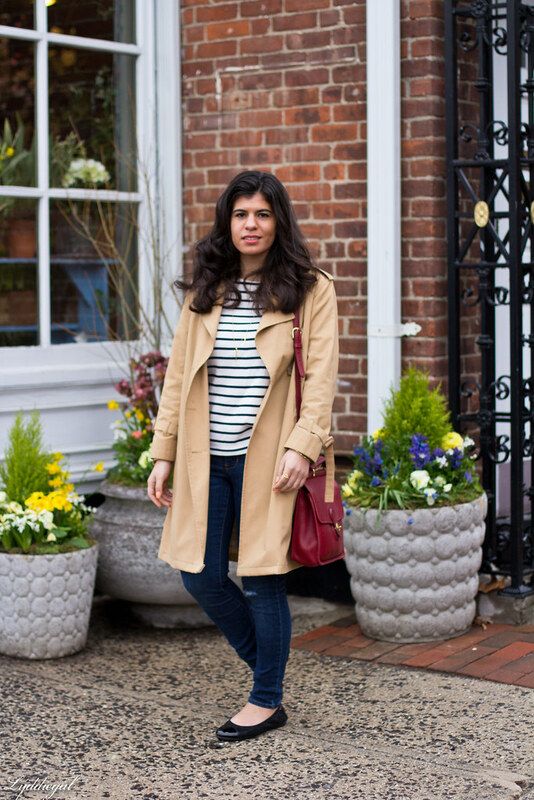 You look amazing, I love your trench, so in this season! In love with that trench dear!!!!! 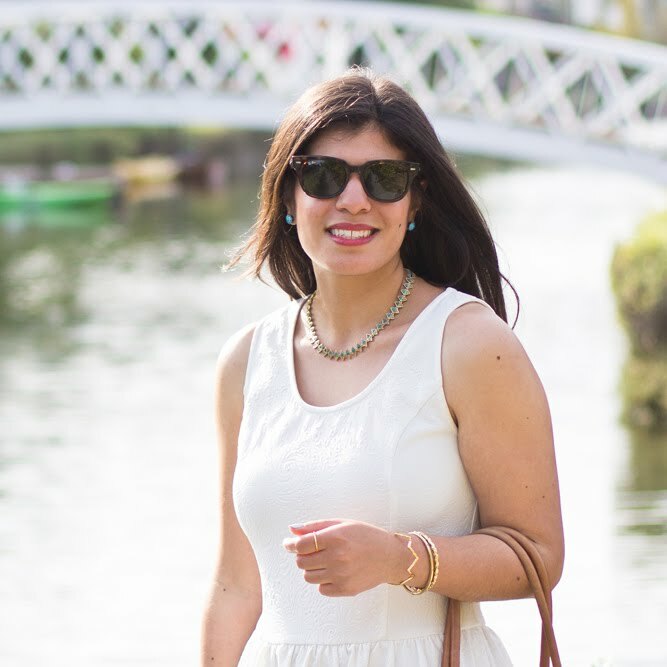 You look like you could be walking the streets of Paris in this outfit! 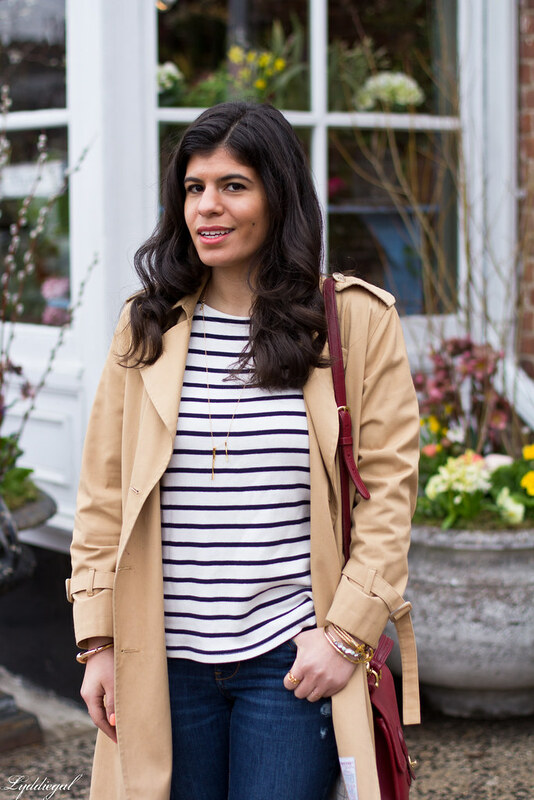 Love the stripes and trench! I love that your last two outfits feature classic and neutral colors, patterns and styles such as dark blue denim, black jeans, camel blazer/coat, stripes, chambray and leopard. Love these two last outfits and I have worn similar versions of them, myself. Have a great weekend, Lydia! Those jeans look like they fit you like a dream! I love the subtle nod to nautical in this outfit, too. Those bracelets are adorable! Yay! 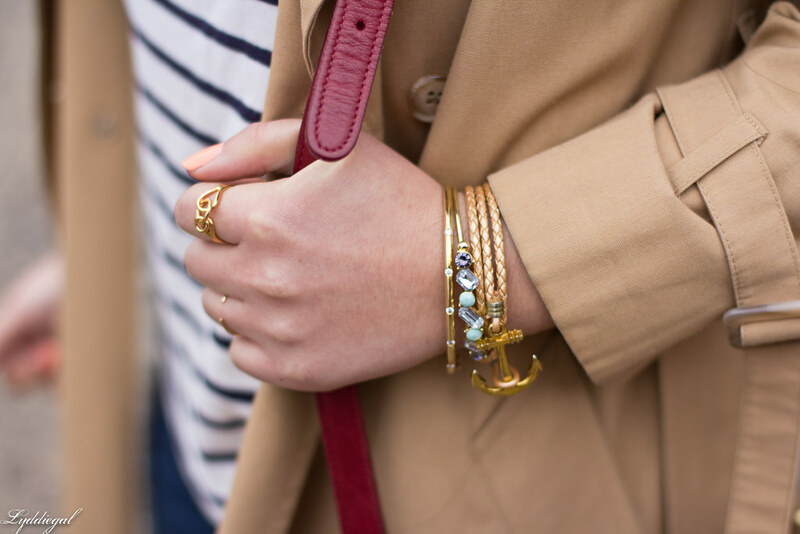 No more snow :) I love your striped top and anchor bracelet! That looks like the perfect striped shirt, it is adorable! 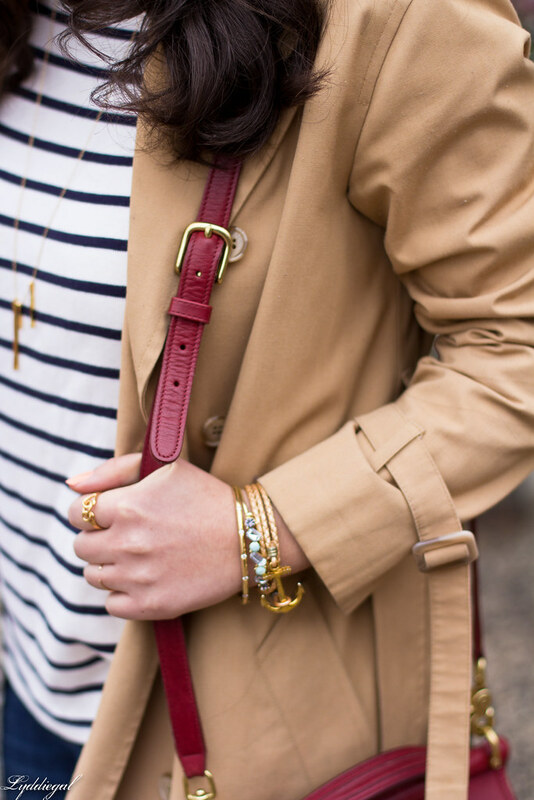 Love the trench! I am on the hunt for one right now. Our days here in OK have been so funny. One day it will be hot and the next chilly and rainy. 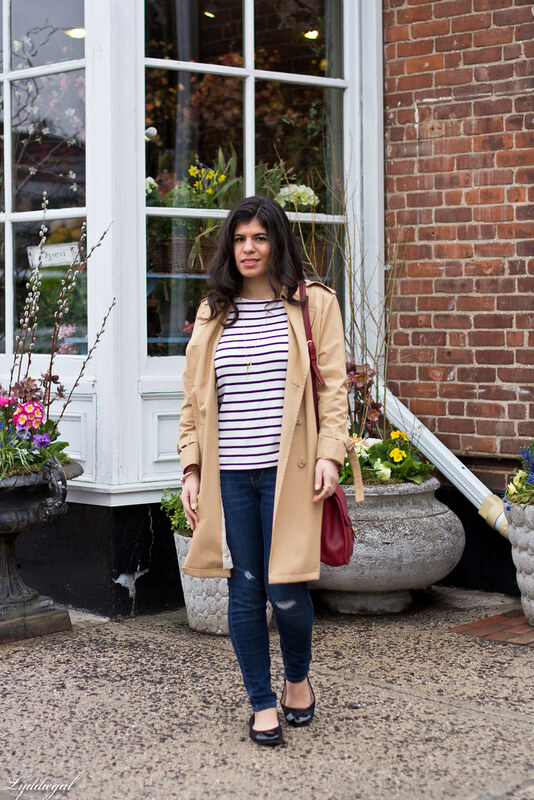 That trench is perfection for chilly spring days and I adore your delicate necklace. I hope I get to see New Canaan in person one day - I've read a fair bit about it and then seeing it in your photos, I can always tell that it lives up to the hype. And what a perfect classic look for walking around in such a charming place. You've reminded me of that fact that I still need to add a good classic trench coat to my wardrobe. And a vintage Coach bag, too! Yay!! So glad it is starting to feel like Spring!! 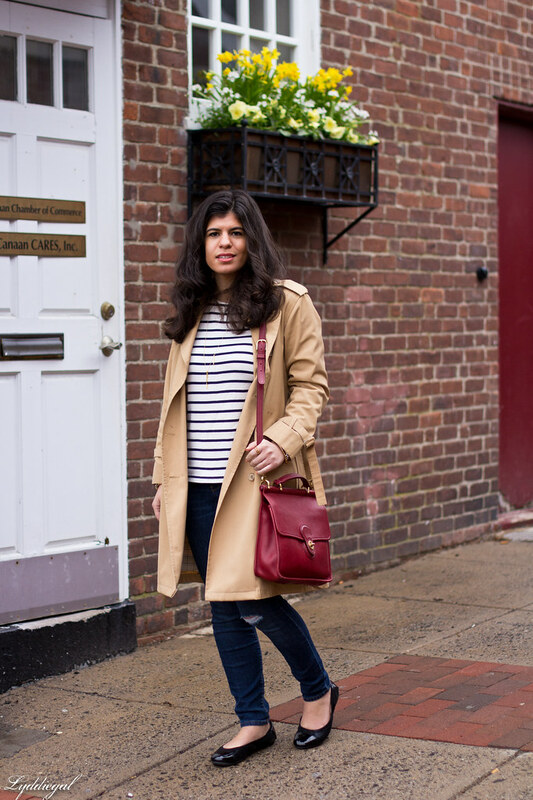 So in love with that trench! It looks perfect with the stripes and those pretty necklaces! What a beautiful location and an even prettier, classic look! 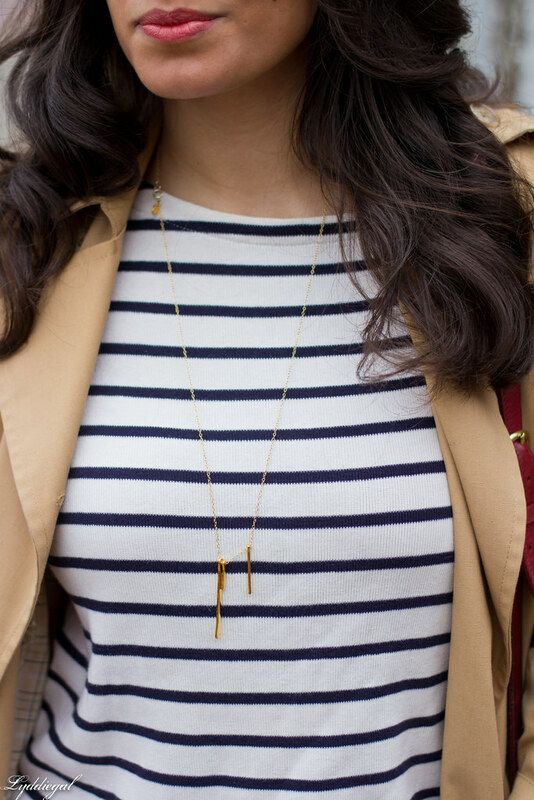 That necklace is perfection with stripes. This is such a gorgeous look!!! I really, really dig that top and trench together. I love this pretty, classic look. You always know how to turn it up a notch with your jewelry--the necklace and layered bracelets really make this stand out. Love it!